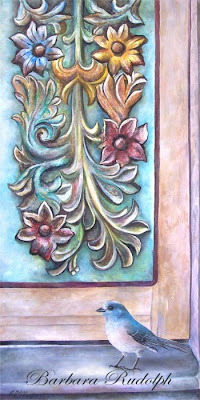 This is an oil painting that was inspired by a beautiful doorway that I photographed while visiting San Miguel de Allende, Mexico. 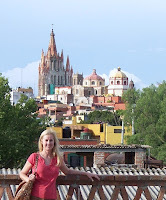 A few summers back I took an oil painting workshop in San Miguel de Allende, Mexico. The mornings and afternoons were spent painting, while the late afternoons were free to spend time wandering the narrow cobblestone streets of the city. The colonial architecture of San Miguel is lovely and the streets are lined with elegant stores, art galleries, quaint hotels and beautiful homes. One of the things I liked the best was the beautiful carved wood doors on many of the homes, and I just had to paint this little Mexican jay. San Miguel is an art lover's dream. I really like this. I would be interested in a style like this for my collection.